That’s two carry permittees stopping crimes in two weeks. I suspect the cops will not identify the shooter, so as to avoid any possible retaliation – but the clerk is a hero. This has been added to the Good Minnesotan With A Gun series – which is piling up fast. I’m glad the store employee is unharmed. 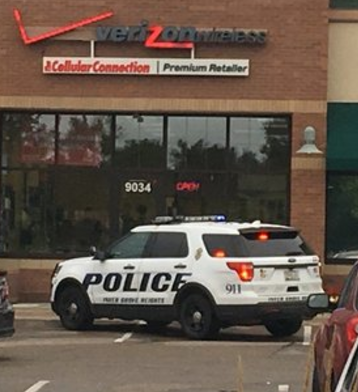 Why the heck was the perp trying to hold up a cell phone store? Hey bad guys, careful or you may end up perforated. Nothing works better to stop an evil-doer then a good deterrent. Does this mean Verizon is a gun-safe zone? Glad to see the clerk escaped injury and hope he continues to be gainfully employed. Both the Mpls and St. Paul papers covered this the first day; only St. Paul stayed with it with more details on day two, then Mpls did a follow up on Sunday. It has come out that the armed robber has a long string of violent offenses going back to his misspent youth, and is currently on probation for his last assualt. His condition is critical enough that the police are not keeping officers at the hospital; he’s not going anywhere for awhile. The papers have also noted, with implied horror, that a worker at a neighboring store was grazed by a bullet. This is a fact, and not to be taken lightly, but my spidey-senses are tingling that the focus will shift to “this is why we can’t have citizens with guns” instead of why the serial offender was out and about.